When sat in my office at work I always seem to be peckish about 11 o'clock. There are always cakes and sweets available but usually they're not free from anything so I miss out. I wanted to make something healthy, yet filling enough to get my through to lunchtime. I usually grab a banana or an apple, but there's only so much fruit you can eat without getting bored. So I googled it and found plenty of different recipes for energy bites. But I didn't have many of the ingredients so I made my own recipe up! I found some peanut butter in the cupboard which contains sunflower and flax seeds, which is amazing btw! 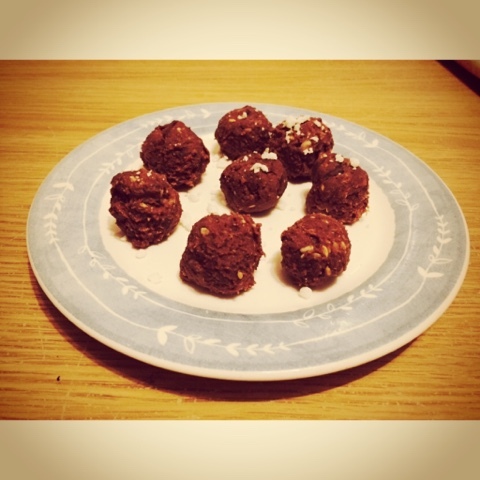 Some dairy free chocolate which was leftover from Spain and some pitted medjouled dates. It's the simplest of recipes! 1. Chop up the dates. 3. Melt the chocolate, and stir it in the mixture. 4. Mould the mixture into little balls and place on a plate. 5. Put the moulded mixture in the fridge for about half hour to an hour until they are hard enough.